As you may gather from my last pages I've been on holiday. 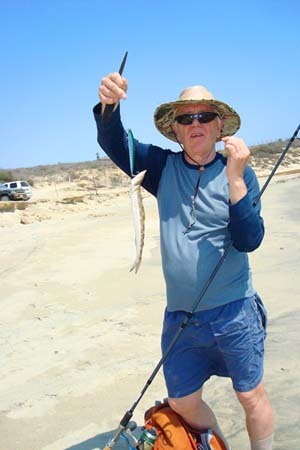 This time it was a fishing holiday to a place I've never been before - Baja California - a huge inlet known as the Sea of Cortez on the west coast of Mexico. To get there we (my pal Steve Pitts and our wives) had first to fly to Los Angeles, to stay ovenight and then to take an Alaska Air plane down to Baja. Anyone who wants to know a bit about the biological richness of this area should try reading the wonderful book "The Log from the Sea of Cortez" written by John Steinbeck and published in 1951. Anyway, things did not start well for us. Steve and Lyn (who had all the tickets and information for the trip) were delayed by an accident on the M4 and after a stressful few hours (thank heavens for etickets) we had to fly without them. They took the next flight and caught us up in Los Angeles later that day. The following morning we arrived at the southern tip of the Baja peninsula, picked up our hire jeep and set off into the unknown. First impressions - jeez it's hot. Anyone old who (like me) may have seen the film "Treasure of the Sierra Madre" with the cast crawling through a stony desert and gasping for water will get the picture. A landscape of giant cacti, creosote bushes and sand had Steve whistling the theme from "The Good the Bad and the Ugly" before we'd gone fifty metres. Now most anglers (and there are LOTS of them from the USA and elsewhere) who go to Baja want to experience the boat fishing for oceanic fish such as dorado, wahoo, tuna, sailfish and marlin which abound just offshore (Steve saw a marlin clear the water as we stood fishing on the beach). Not us! We were all set to fish from the shore. As usual we intended to 'play it by ear'. From the internet we had gleaned a bit of information about what sort of fish to expect and there were even a few pages about bottom fishing written by visitors from the UK but, on the whole, we were winging it. In these circumstances I always hope for the best and anticipate the worst. Even the fishiest destinations suffer from the 'You should have been here last week!' syndrome. 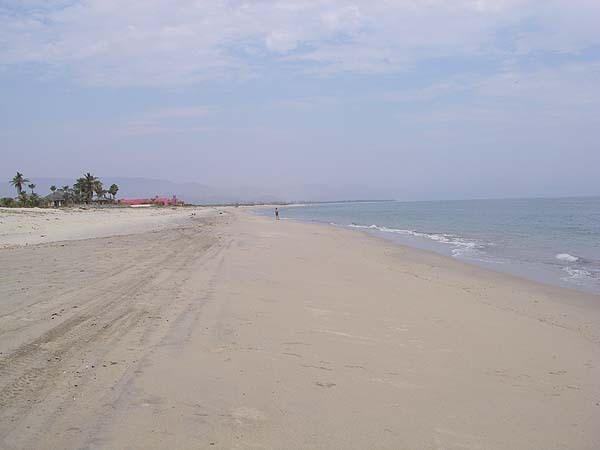 Our first week was spent in a house, virtually on the beach, in the village of La Ribera. 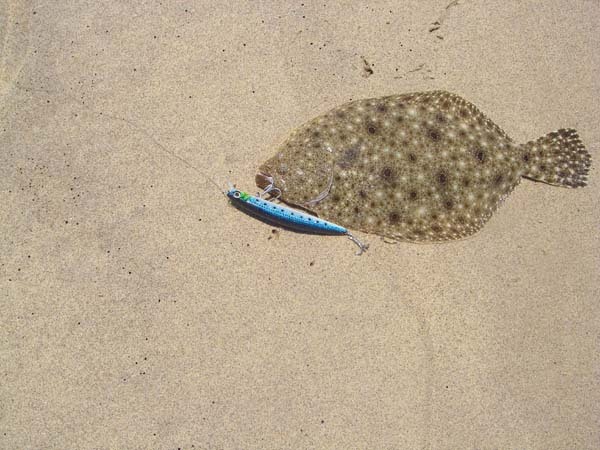 From our place we could see the blue waters of The Sea and it was only a minute from the door to casting a lure. Before I mention the fishing I should say a little bit about the place. You might think that being 'desert' it would be barren and lifeless, nothing could be further from the truth. Of course there were vultures and snakes, scorpions and lizards but the diversity of plants and animals (I'll probably put some pictures on in a week or two) had to be seen to be believed. Anyway, the fishing! We were both hoping to catch rooster fish. Neither of us had ever hooked one of those wonderful black and silver shoreline predators (my son Richard had a couple when we went to Costa Rica) and we were keen to get to know more about them (you can't always believe what you read in the magazines). Our first morning (crack of dawn) produced a variety of fish including the inevitable lizardfish which seemed to be everywhere. After breakfast we had another go and on about his tenth cast with a 'Bullchop' lure Steve hit a reasonable fish that careered about and splashed at the surface. Within seconds we could see that it was a roosterfish with black barred sides and long fin filaments - amazing! 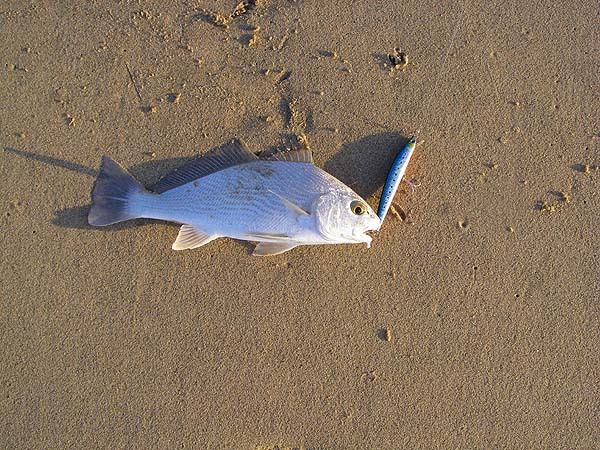 However, after all the excitement and a short battle the fish came unstuck. Nevertheless it was a flying start and raised our hopes for more of the same. It was not to be and the rest of the day produced everything but more roosters. 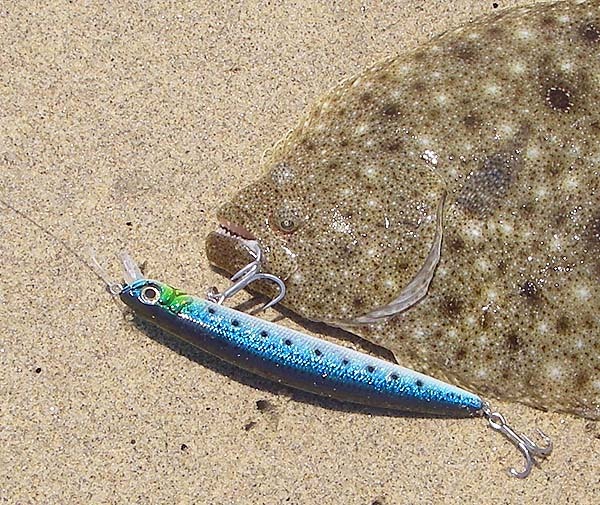 We had lizardfish galore, croakers, houndfish and even a flatfish on plugs and surface lures. All in all a good start to the trip but more next time.